Whoa! You can’t favourite your own shop. Oi! You can’t buy your own item. Hold on! You can’t favourite your own item. Whoa! You can’t add your own item to a list. *Original illustration illustrated by Mojca Dolinar. 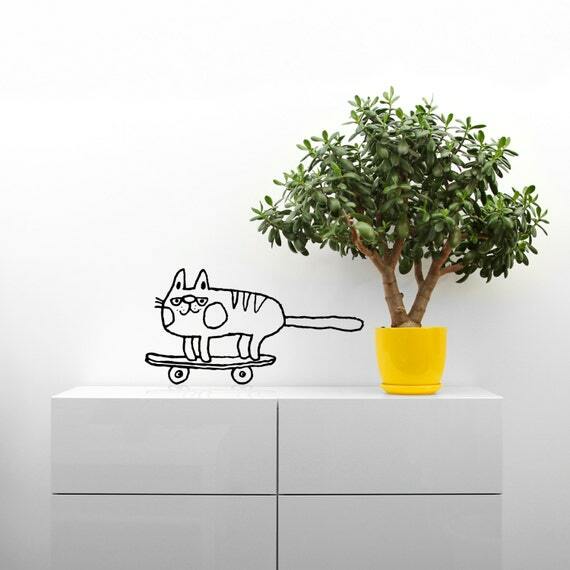 Cat skateboarder. *It is made of high quality, self-adhesive scratch resistance vinyl. It has a mat surface which means it looks like painted when applied to your wall. Wall decal is removable and will not ruin your surface. *It can be applied to any clean, smooth, flat and semi textured surface and is intended for interior use only. *Each decal comes with easy to understand instructions. We send our wall decal in recycled paper tube. We really enjoy making custom orders and we would love to make you one. Just let us know and we will do our best to make it happen. Please do not hesitate to contact us with any questions or concerns. Easy to apply. Excellent customer service! Would definitely order again. Almost gone. There’s only left.Almost gone. There’s only 1 left.